While the holiday season is a time that many people associate with a well-earned break from the daily grind, and quality time with family and friends, criminal-minded people associate the holiday season with an opportune period to break into commercial businesses to commit theft. So that your commercial business is not victimized during the holidays, here are five security tips to deter thieves. While intrusion alarm systems are important, it’s critical that you ensure that everything works as it should. For instance, you need to examine your video surveillance cameras to see whether or not they are working well enough to capture usable images should thieves decide to target your commercial property. If you were thinking about repositioning your video surveillance cameras, the lead up to the holiday season is a good time to do so. If you have an issue with your CCTV system, call a security professional to come and take a look. Perhaps you’re the sort of commercial business owner who likes to go all-out with decorations during the holiday season. If you are, be sure that any decorations or displays that you set out don’t obstruct your intrusion alarm systems or CCTV cameras. Anything blocking your video surveillance cameras or motion detection sensors could trigger false alarms or compromise your system if thieves break into your property. When the holiday season rolls around, you might need to update your notification list so that the intrusion alarm system service provider knows whom to call in the event of an alarm or emergency. Be sure to forward an updated holiday list to your service provider, and let the service provider know if and when you will go back to the regular notification list. 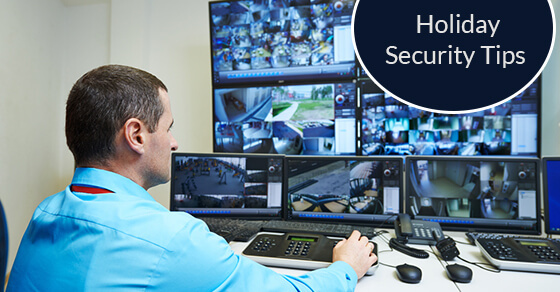 During the holiday season, it’s a good idea to spend more time than usual monitoring the live feed from your video surveillance system. This can be done by yourself through an app on your phone, or through a monitoring provider who provides remote video monitoring and video verification of intrusion alarms. Be sure to encourage your workers to be more vigilant during the holiday season. You should tell them to report any suspicious activity, and to keep their eyes and ears open at all times. This will definitely help to keep your commercial property, not to mention your human capital, safe over the holiday season. Enjoy the holiday season, and take some time to relax and enjoy a little time off. But remember that criminals never take a break. In fact, they maybe on the prowl during the holiday season, targeting commercial businesses. Be sure to ensure your intrusion alarm systems and CCTV systems are running at optimum capacity to keep your assets safe during the holidays. Combined with the tips above, the right intrusion alarm system and CCTV video surveillance system will make your commercial property safer .